This may be a silly question, but if someone is uploading from a Mac, will it still be able to verify from the extension if there isn't one? I think the browser may be able to send the appropriate mime type if there is no file extension (I would have to look into that further), but remember you can't trust what the browser sends anyways, it could be spoofed. Pete, excellent tips. Disabling execute permissions on uploads directory is really nice. I'm revisiting an app that allows customer file uploading, and one approach I'm considering is using CreatUUID() to generate a server side file name and stick the customer provided filename in a related database entry (going through cfqueryparam, of course). Pete, great post. Thanks for the tips. I've been meaning to blog about this myself. You beat me to it. But you also covered quite a lot that I didn't know, so thank you for that. Very enlightening. Great tips, thanks for sharing, Pete. I'm comforted by the fact that I tend to follow all suggestions you've made, with the exception of a static content server. I really do like that idea and intend to leverage Amazon S3 for static content whenever possible in the future. It's worth noting that you could achieve similar security on your own server, if needed, by leveraging Apache and creating a static content virtual host. You can have that virtual host limit file extensions and/or mime types and rewrite to 403-forbidden any suspicious requests. @Jamie thanks, yes that is worth noting. I didn't intend to suggest that S3, or some third party CDN was the only way. Just so I'm clear: the problem isn't really that they can upload a CFML file, it's that they can predict the URL afterwards in order to execute it, right? If so, placing an Application.cfc / Application.cfm file in your images directory that blocks requests would be sufficient to prevent execution? Or am I missing something? @Sean - They don't necessarily have to be able to predict it, the application may disclose it in an image tag, or link. 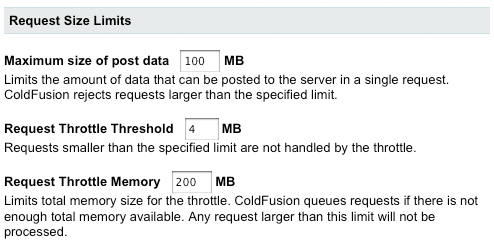 Adding Application.cfc/cfm is a good idea, but it can only block ColdFusion requests, I could upload a .jsp file instead, or some other file type that might be executed server side. Extending the sandbox design: We protect uploads from getting downloaded, without the application running more CFMX code to authorize: Having Enterprise on *IX, we build a sandbox, where * doc, a directory outside the Apache directories, allows read, write, delete for CFMX. OS permissions allow only j2ee to write, any can read. * backend, another directory outside Apache, allows only read for CFMX. OS permissions allow only the project owner to write, any can read. Now CFMX code can scan the backend directory and authorize what the user can see. Meanwhile Apache can't leak the files on its own. Application code must decide whether to read from those directories, and decide what to send to who. (And it's late, so I'm too tired to clean the grammar.) Anyway, dittos on all the rest, and THANKS! Hope it helps. What about if you have CFIDE available for a shared server (for CFAJAX stuff) - are you then more vulnerable for these attacks that wreak havoc in the CF-community these days? And how to defend yourself and your server (and hostingprovider)? PS: My Gravatar is enabled via my Hotmail address - any chance you'll allow those mail-extensions in the future? @Sean, You make an excellent point I haven't thought about. You can effectively disable CF from ever executing from that folder with the right application logic. However, it still leaves open the possibility that bad files can 'exist' on the server to be exploited outside of being executed by CF. @Pete, How could I do a good file extension test before the file itself has been uploaded by CFFILE even using all the security mesures pointed here? Or the file will be uploaded first, then tested for extension and finally deleted by CFFILE DELETE? Thanks. @Marllon Yes as Jamie mentioned you need to upload the file to a dir outside of the web root and then check the file extension. Otherwise the only way you could do this before calling cffile would be to use a Servlet Filter, or something else that runs before the CFML engine. I'd just like to point out, in response to the first commenter, that Mac OS X files do indeed have file extensions. By default they are hidden to the user but upon sending a file out (as in this case) they do apply. I just wanted to chime in to remind people that the same goes for emails which attachments that are downloaded by CFpop. I have a system which acts as a web client for accessing email ( <gasp> and saves the attachments into a pub directory</gasp> ), and I basically crapped myself when I realized that I was doing no checking, and someone could have simply emailed us a CFM file. My two faults here are A: serving attachments publicly and B: Not filtering attachments. Very old app, but Jeeze! Horrible. Hi, I've seen comments about checking for a double file extensions. Does anybody have any code that would allow me to do this. Does anyone have any suggestions for virus scanning on ColdFusion file uploads? We want to allow trusted sources to upload files to us, but we are worried about files with viruses being accidentally uploaded. Thoughts? Thanks. Was this fixed? We have a CF9 & CF10 box, and just wanted to know if it had been addressed or not.